The 2006 box, showing several of the represented characters. The two versions of the game's boxes. 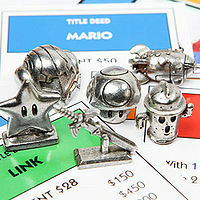 Nintendo Monopoly is a board game based on the classic board game Monopoly featuring Nintendo characters such as Mario, Luigi, Donkey Kong, Yoshi, Link, Samus Aran, Kirby, and various others. It was released in July of 2006. In the game, Nintendo characters are used as properties. Super Mushrooms (referred to as "Power-Ups" in-game) are used in place of houses, whereas Stars ("Invincibilities") take the place of hotels. In 2010, a revised edition of the game was released. Although the core game is relatively unchanged in this update, several artistic tweaks were made. The artwork was revised, and the board no longer includes a collage of screenshots. Rather, a lineup of characters is displayed across the board instead. Several spaces on the board were also changed; most notably, the light blue Star Fox properties were replaced with characters from the Animal Crossing series. The four corner spaces, GO, In Jail/Just Visiting, Free Parking, and Go to Jail, are unchanged from the original Monopoly game. Clockwise from top left: Link's Iron Boots, a DK Barrel, the Hylian shield, Mario's Cap, an NES controller, and a Koopa shell. Clockwise from top left: Samus' Helmet, a Mushroom, the S.S. Dolphin, a Gyroid, the Master Sword, and a Star. NOTE: There are two of the "Advance Token to the nearest Railroad/Vehicle..." cards. The purple property group (Waluigi and Wario) was changed to brown. The 1-Up Mushroom space no longer gives players the option to pay 10% of their money. The Treasure Chest Deposit space now costs $100. The artwork was also changed from Wario's Treasures to a coin. The dollar value of the Coin Block cards Player's Choice Award, Organize a Mario Party and Renew Kart License were decreased. The game's box incorrectly implies that the Master Sword from The Legend of Zelda is "Zelda's Sword." In fact, Zelda never wields the sword. The box was later changed to say "Link's Sword" because Link is actually the one who uses the Master Sword. Bowser is shown on the box, and he is mentioned on a ? Block card, but he does not make an appearance in the game itself. The game photo montage in the center of the 2006 board includes a picture from Super Mario 64; this shot is from a prototype, as evidenced in the colored number displays. Kirby and King Dedede are shown on the gameboard. However, their designs are taken from the anime "Kirby: Right Back at Ya!". Meta Knight also appears as he did in "Kirby: Right Back At Ya! ", but his appearance is from an episode (without a background), not his official artwork. There is an error on the 2010 "Advance token to the nearest vehicle" cards, as Epona is listed as one of the four possible destinations. However, it is impossible for this card ever to send a player to Epona, due to the fact that there are no ? Block Spaces between Pikmin Onion and Epona. This page was last edited on April 7, 2019, at 00:08.